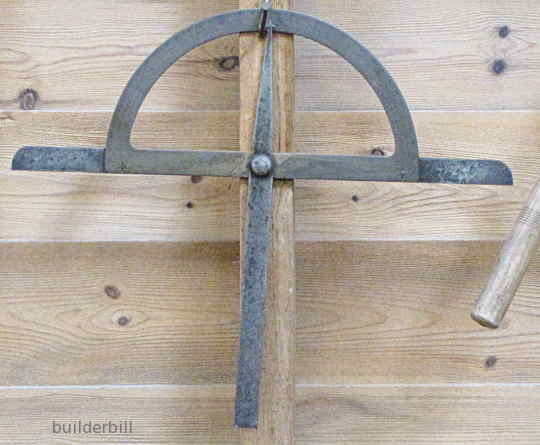 A hand tool for marking angles. Consisting of a stock, either metal or wood, and a movable sliding metal or wood blade. The photo here is of a carpenter's bevel with a wooden stock. When not in use the steel blade is designed to partly tuck inside the handle. The wing nut is the means of tightening the bevel into position. Bevels like this one are used in carpentry work for firstly obtaining angles by directly placing them against a pattern or setting out board and then the bevel is used to mark out new pieces to be cut. A metal workers all steel bevel. This is an old example, and the fine graduations on the semicircular scale do not show up on the photograph. This would be a direct descendant of the more modern combination square which can be used for not only marking angles but also because of the graduated scale it can also be used for finding the angle in the first place.